one day! I found another very similar blog called iralamijas by Bety. Please do not ask me how to pronounce it! She also does some fabulous shabby chic and she has a workshop you can pay to join until May 15th; the workshop is open until the end of the month. I have been analyzing what elements make a card shabby chic so I finally got brave enough to try it. Hope you like the result. 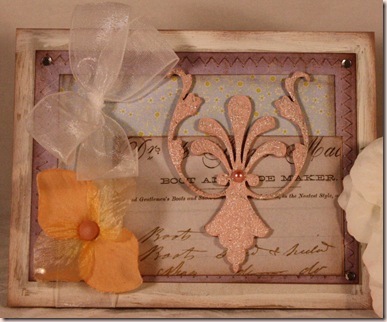 I would link you to the specific card I CASEd but it is part of the workshop and you need to be registered to see it. Kimmie’s son Nicky was our Temporary Twinkle this week and chose a colour challenge-Blue, Orange and Purple. WHEW! That one really threw me! I never use bright colours-Hello, who said you had to use the bright versions of those colours? OK, technically light orange is called peach but close enough! Do I really have to use peach anyhow? I planned to use pink instead. So I chose my papers, both Basic Grey and layered them on a Kraft card edged in white paint. All layers are sponged with cocoa or caramel ink. The chipboard is painted with pink and covered in white Stickles (boy that stuff takes ages to dry!) Then I got to the flower which was pale yellow. It was an ordinary silk hydrangea that I took off the stem. Then I realized I could add Copic marker and make it peach fulfilling the ‘orange’ of the colour challenge. I added YR00 to the soft pink brad also to make it more peachy. Overall, I’d prefer a pink flower there and I may still change it. What do y’all think?? Keep the peach or swap out for pink? Be sure to play along with the Twinklettes! Upload to your blog or SCS/PCP with keyword MTTSC22 and link to Madelynn’s Twinkling Tuesdays blog so we can all see your creations! Don’t forget to visit all the other Twinklettes to see their fabulous work!! Have a great week! Paper: Basic Grey LilyKate and Gypsy DP, kraft CS-SU! Very pretty Rebecca. I like the Shabby Chic look you created with these colors – even if it is peach instead of orange. Great job on the challenge! Rebecca, this card is sooo pretty! I love that shabby chic look!I’m a pink person too…. seems as though thats what I’m always grabbing. 🙂 Have a great day! This is a great shabby chic card Rebecca!! I love your subtle tones but still using this week’s challenge colors! Great job! Isn’t Betty’s blog incredible!? I found it last year and her work is breathtakingly beautiful. WOW!! This is absolutely beautiful! Great job! I think you did a great job. This card is so whimsical. I’m going to say that peach is close enough! and that this creation is absolutely JAW DROPPING gorgeous! I love it and those on-line classes are the best as far as not having to travel anywhere! I follow Melissa Phillips blog also and I just drool over her beautiful loveliness!